You may have already come across Knowmedge’s coverage of several other ABIM Internal Medicine Board Review books. Today, we explore the “big daddy of them all”—the Medical Knowledge Self-Assessment Program (MKSAP), created by the venerable American College of Physicians (ACP). Ask any Internal Medicine resident—1st, 2nd, or 3rd year—how they plan on studying for the Internal Medicine board exam, and their response will surely include “MKSAP.” Furthermore, residency chiefs have developed a tendency of using MKSAP questions for board review at morning report, noon conference or even afternoon educational sessions. There is a reason for its vast utility: MKSAP is truly an authoritative guide to reviewing the curriculum covered in the ABIM Internal Medicine Board Review Blueprint. In its 16th iteration, the MKSAP content has been refreshed as well as the user interface on the app/desktop versions creating a better learning experience. First and foremost, with dozens of contributors in each of the major internal medicine sub-specialties, the medical content in the text and 1,200 questions is well-researched with bibliographic citations. Lots of tables and figures help break up the text which can otherwise be cumbersome to stay engaged while reading. Later in your studying, revisiting these tables is a good approach. One of my favorite features is the High-Value Care Recommendations that opens each book. Here’s why: the folks behind the ABIM, like the healthcare policy makers, are concerned about the overuse/inappropriate use of tests in the diagnostic work-up of commonly encountered symptoms. Thus, these points which emphasize unnecessary tests/treatments may be commonly tested on the actual exam. Furthermore, I’ve referred back to this section during patient care to determine if a test is actually necessary or extraneous before initiating treatment. 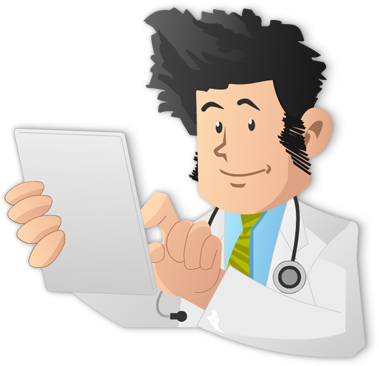 Dermatology contains vivid photos of the skin lesions commonly encountered on the exam. However, it would be nice if they had had a separate section with just images so you can quiz yourself near the end of your exam preparation. Same goes for EKGs on the cardiology section and chest xrays on the pulmonary sections. Each subject area is a separate book (in the print version) or a separate heading in the digital version making it very easy to handle physically. I recall using MKSAP 15 on my specialty rotations. I’d carry the appropriate book around but they wouldn’t unfortunately fit in my white coat pocket. The MKSAP online version solves this problem as many residents have found. While the figures and photos do break up the monotony of the text portions, the question explanations are still too long. I can understand the need to have lengthy text in the syllabus (MKSAP 16 is a powerful clinical tool and a nice reference to have when reviewing a patient’s diagnosis), for questions, it’s not high-yield and efficient to have to read 4 or 5 paragraphs after each question. In fact, this was the reason Knowmedge was created. We felt that in the 21st century, the Internet allows better methods to facilitate knowledge retention such as audio-visual explanations. An H icon highlights topics that address “the learning needs of the increasing number of physicians who work in the hospital setting.” Since this feature is mentioned in the letter from Dr. Patrick Alguire (Editor-in-Chief ) at the beginning of each book, I initially thought it was beneficial. But then it occurred to me that for someone not studying for the Hospital Medicine Maintenance of Certification, it’s not entirely clear what to do with the icon. Surely, I don’t just skip over the blue text sections like porphyria cutanea tarda diagnosis and constipation management, which are just as likely to be on either exam. Instead, it ended up just being a distraction. A final minor point (literally): the index on the print version of MKSAP is in the smallest type I have ever come across. It must be 8 point or less. I don’t have any near vision problems and I felt tempted to reach for a magnifying glass. MKSAP Online: The digital version is much improved from the previous iterations such as MKSAP 15. While it now allows better analytics of your question responses, its interface is not as user friendly as one would hope. For instance, unlike most websites/ apps the menu toolbar appears on the upper right side of the screen rather than the left side. On the app, overlays should have been utilized for Normal Lab Values and Bibliography and Key Points rather than forcing the user to leave the current topic. 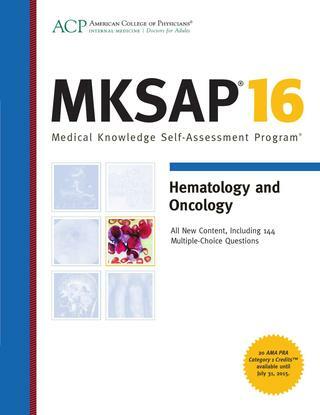 While there are areas of improvement that could be made, overall, the MKSAP 16 Books are a valuable and authoritative source for Internal Medicine Board Review.